A California sheriff’s office has been provided two undeveloped rolls of film documenting the 1987 autopsy of Liberace, material that had been held for safekeeping by a state investigator who died last month. The film was turned over last week to the Riverside County Sheriff’s Office by a relative of Lehman Snellings, a coroner’s investigator who died July 17 at age 68. According to Snellings’s son David, his father--who retired in 1996--took possession of the film in an attempt to safeguard it in light of “media hype” surrounding Liberace’s death. 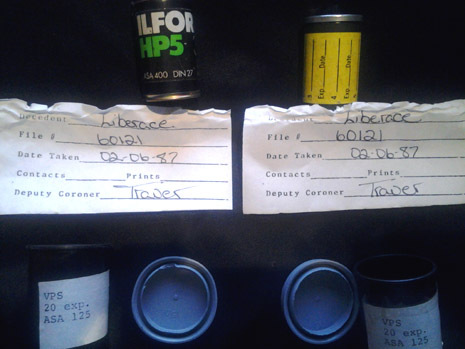 As seen above, the two rolls (one of which appears to be Ilford black and white film) included labels with Liberace’s name, the coroner’s file number, and the surname of the deputy coroner, Nancy Traver, who handled the investigation into the 67-year-old entertainer’s death. The labels also are dated February 6, 1987, the day the Riverside coroner autopsied Liberace. 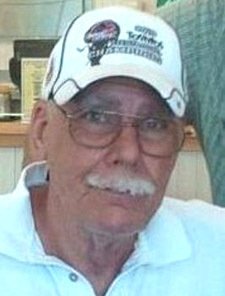 Snellings said that he had been offered several thousand dollars by the National Enquirer for the film. “And while I could have used a few bucks, again, not worth it,” he noted. A sheriff’s representative, Lt. David Kurylowicz, confirmed that his office last week received the two rolls of 35mm film, adding that investigators had no reason to doubt Snellings’s account that the film memorialized Liberace’s autopsy. Lehman Snellings is pictured below. Kurylowicz, who is in possession of the two rolls, said today that he would provide the 35mm film to a forensic supervisor. If the rolls can be processed, they will be developed into negatives, from which contact sheets will be made. The material will then be added to the Liberace case file. The Riverside coroner ordered an autopsy of Liberace since there were indications that he died of a communicable disease. Additionally, a doctor was not present when Liberace expired at his Palm Springs home on February 4, 1987. While the star’s physician claimed on a death certificate that Liberace died of heart failure brought on by an inflammation of the brain, the coroner concluded that the entertainer actually died of AIDS-related complications. For decades, Liberace’s sexuality was a preoccupation of supermarket tabloids. The star publicly denied being gay, and even filed legal actions against publications that identified him as a homosexual. 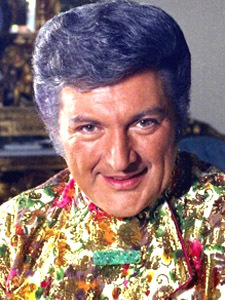 In May, HBO broadcast “Behind the Candelabra,” a Steven Soderbergh-directed film about the final ten years of Liberace’s life. Based on a book by Scott Thorson, Liberace’s former assistant and ex-lover, the film starred Michael Douglas as the flamboyant pianist and Matt Damon as Thorson.